SOUPY ROADS — This was a portion of 240th Street, west of Albion, on Friday, April 12. Rain and heavy wet snow last Wednesday and Thursday created more travel difficulties on gravel roads around the county. More rain was in the forecast for April 17-18. 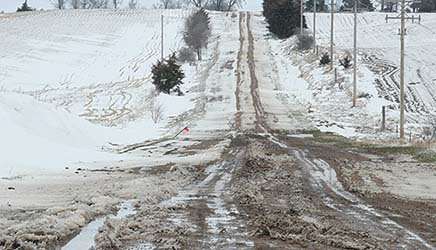 Rain and snow last week created another setback for gravel road conditions in Boone County, but progress is still being made in most areas. Road crews are repairing roads and bridges damaged by flooding March 13-14; but road conditions in much of the county took a second hit from several inches of heavy wet snow and rain on Wednesday and Thursday, April 10-11. When conditions have allowed, county road employees have been working overtime and Saturdays, Ziemba said. Commissioners on Monday approved Ziemba’s request to hire temporary part-time employees to assist with road repair. The county has also been using private contractors in repairing damage from the floods. Complete story in the April 17 Albion News and Petersburg Press print and e-editions.